Ano Hi Mita Hana no Namae wo Bokutachi wa Mada Shiranai (AnoHana) original anime by director Tatsuyuki nagai and screenwriter Mari Okada will be getting its own manga adaptation. The story will be published in Shueisha’s Jump Square magazine and will be created by Mitsu Izumi. The mangaka is a new artists and we are certainly going to be quite critical over the work, but I am giving Izumi-san a standing ovation for taking on such a big project. I also with luck with the development of the franchise. The first chapter will appear in April 4th’s issue of Jump Square. 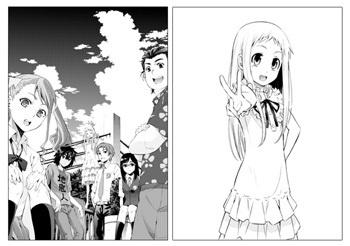 The TV anime series AnoHana (that Flower, you say?) are about friendship, hardship and death. Meiko “Menma” Honma died in a tragic accident, causing the falling apart of the group of friends she belonged to. Years after everyone from her circle has began his or her own life, she appears to Jinta (the one she supposedly had feelings for more than for the others) and tells him she has a wish that needs to be granted, but she is in the dark about the wish itself. The secluded new life of Jinta is to end due to the ghost of her childhood friend.